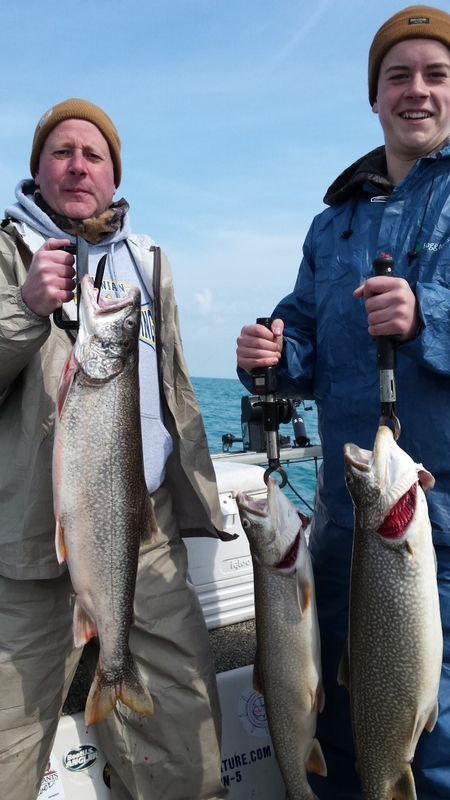 My business is to provide people the opportunity to sample the exciting and challenging fishing available at the southern end of Lake Michigan. This page is dedicated to showing a bit of the behind-the-scenes work it takes to do that and to highlight the trips and fun my customers are able to experience. The leader of the “A-TEAM” on the old TV show popularized the maxim, “I love it when a plan comes together.” Who doesn’t? The first steelhead of the year has been caught. I love it when the weatherman is right about favorable climatic conditions and waves on the lake are negligible. I love it when the fish have been biting well, stay in the same place and continue to bite the same lures. When that happens, it’s easy to make a plan and love it when it comes together. But when dealing with wind, waves and weathermen (not to mention finicky fish) the first plan doesn’t always come together. Plan A can be a bust. That’s why I always like to have a Plan B in my pocket when I’m out on Lake Michigan. I’ve been at it long enough to have a whole book of plans and the book of plans really paid off this week. Lake Trout are often Plan B fish, and welcome! I had a group of guys from Kentucky on the schedule for Tuesday and Wednesday. It looked like they were going to hit it perfect, weather wise. Predicted rains were to end before dawn on Tuesday and a couple days of light winds were in the offing. Plan A was going to work! Except, when we actually got out on the water we found “residual” waves from overnight storms and a bit more breeze than the weather-guessers had promised. Worse, the wind was one direction, the rolling waves another and boating was like in a pot of boiling water with lumps and bumps going every which way. Plan B was needed. Though the hot bite area was nearly unfishable, I knew a spot a few miles away where industrial breakwalls would provide sheltered conditions and hopefully, enough fish to make it worthwhile. I love it when Plan B comes together! We caught several salmon, not limits, but enough to keep everyone happy and the first steelhead of the year was captured. On Wednesday, I knew I needed to produce something spectacular for the Kentuckians. Though it’s still early season, I took advantage of the near glass-like conditions of the lake to motor offshore to an area I knew would be teaming with lake trout in a few weeks. Were there any there now? You bet! And even with the increase from 2 per day to a 3 trout bag limit, the KY anglers had no problems - other than sore shoulders from the trout work-out they were given. Our plan of easy fishing nearshore for spring-sized cohos wasn’t missed in the least. Plan B did the job just fine. I started fishing for Lake Michigan salmon in 1969 and finally caught one in 1972. I started running my own boat on the lake in 1980 and became a licensed captain in 1998.